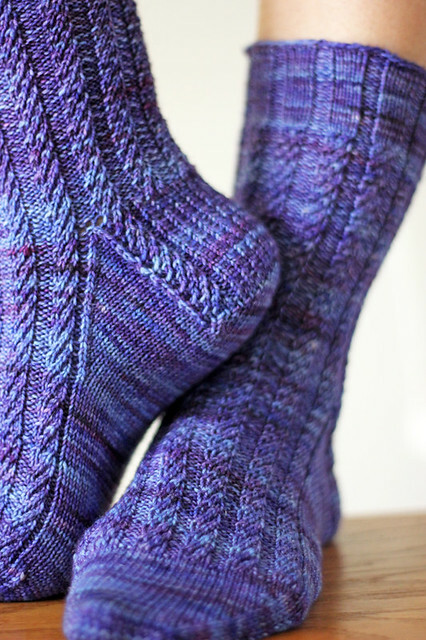 There will be an Etsy Update on Monday, Dec. 3 at 12pm (noon) EST featuring exclusively Thrummed Mitten Kits! If you missed the last update this is your chance to nab one! All orders placed on Monday will ship on Tuesday and will arrive in time for Christmas. 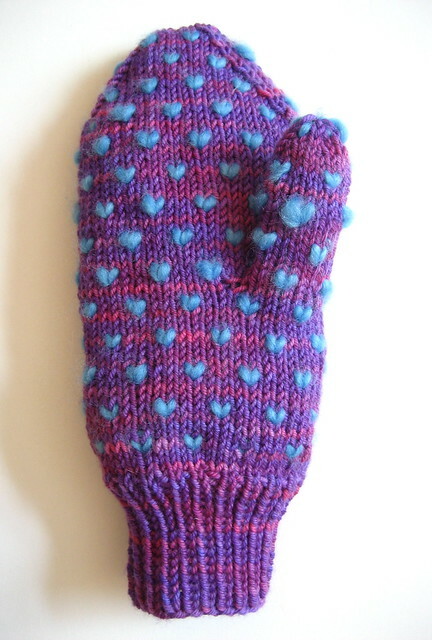 I've been on a real mitten kick lately! Seriously, I've knit 4 pairs of mittens in the past 2 weeks or so, add to that the crazy Thrummed Mitten Kit excitement and my life is basically all mitts, all the time... and frankly, I'm completely ok with that. Mitts are the best. You can never have too many. 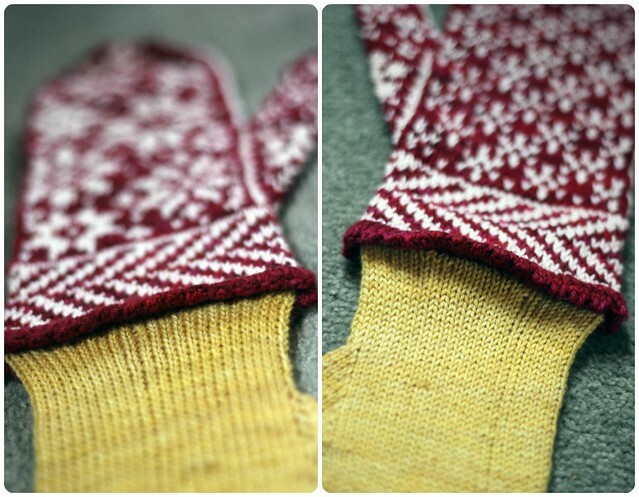 Anyways, I've recently completed my latest mitt design (blurry, secretive photo's above!) and I'm very pleased with it. 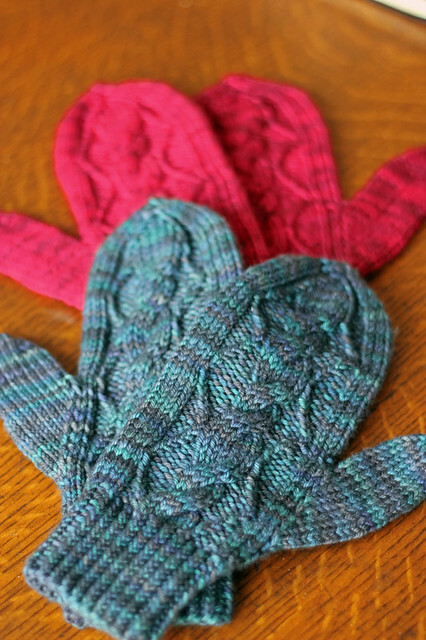 These mitts are beautiful, wintery and warm, what more could you ask for? I knew when I set out to design these mitts that I wanted to knit them in DK weight yarn and line them in Cashmere sock yarn. I love the look and feel of lined mitts, but up until now I thought that I hated lining mitts! 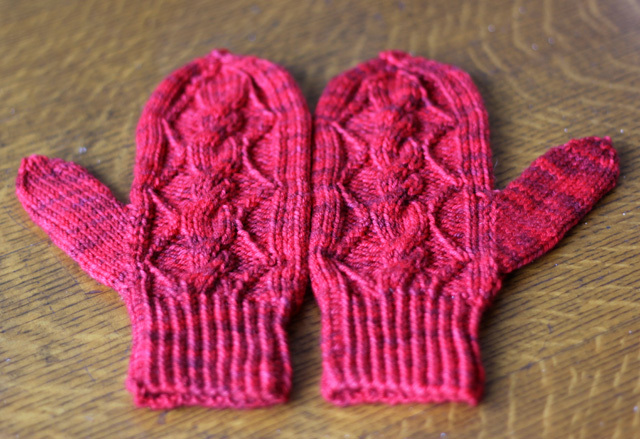 I've knit 3 pairs of Fiddlehead Mitten's and only one pair managed to get a lining. Stranded mitts are doubly warm already, so you could argue that the lining is overkill (I wear my non-lined FMK's all winter long with no problem). But to me, the beauty of the lining comes from the fact that it hides all the floats, so there is no concern about snagging fingers or jewelry. Also, a lining that is really neatly picked up from the inside edge of a mitt is really a thing of beauty. There is essentially no wrong side to these mitts, it's all hidden between two beautiful layers of stitches. So, yeah, I've hopped on the mitt lining train in a big way. Cashmere lined mitts are pretty much the best. This pattern will be available soon! Thrummed Mitten Kit update! Last Friday's Etsy update, which included what I considered to be a whole lot of thrummed mitten kits, was a hit. Thanks to everyone who swooped in and picked up some special one of a kind yarn! And sorry to everyone who didn't get a mitten kit because they sold out so fast! I am already working towards another thrummed mitten kit only Etsy update that I plan to have ready by Monday at the latest. I'll keep you posted about that. In other mitten news: remember this hat? 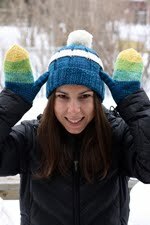 I loved the yarn, but the hat just wasn't working for me, so I ripped and re-knit the lovely mcn worsted weight yarn in Stormy into a pair of mittens! The pattern is my own and is super simple, yet effective. I wore them all weekend and can attest to their warmth and cozy fit. To test my pattern I cast on for a second pair, this time in Green Label Aran Weight yarn in Poppy (an impossible colour to photograph!) I should have the pattern available soon. 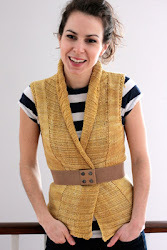 The super talented Jettshin test knit my Coolbreeze Cardigan pattern for me. 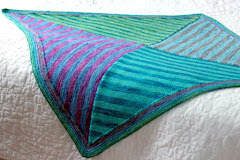 One scroll through her Ravelry project page and you can see why I was thrilled that she was keen to work with me. 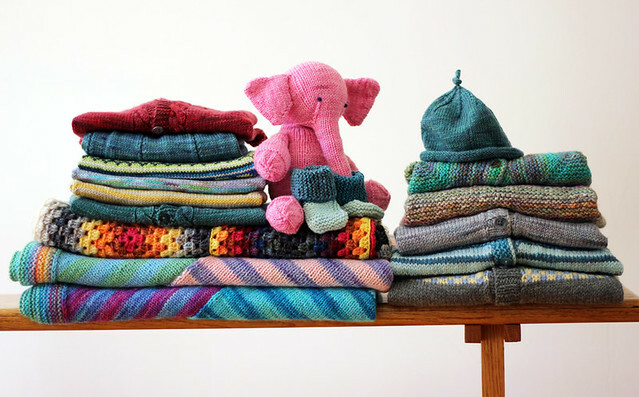 Her project page is like an art gallery of perfectly tailored knits. She can take just about any pattern and make it look like it was made just for her! I opted to have the test knit done in a the Rusty Palette with Sand as the main colour. I thought that it would be neat to see how the pattern/colour worked out with a warm palette on a light background (as opposed to the cool palette on the dark background of my blue version). 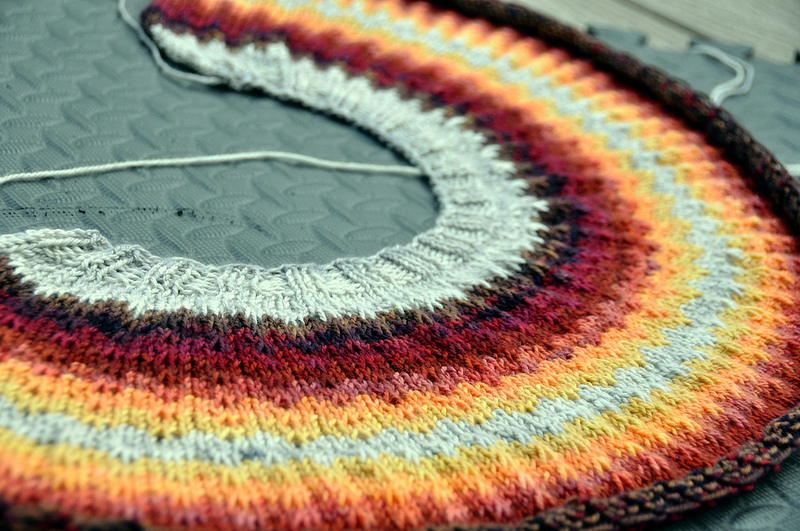 I found this photo of her sweater in progress in my inbox one day and my jaw hit the floor. I love this warm version just as much as my original! 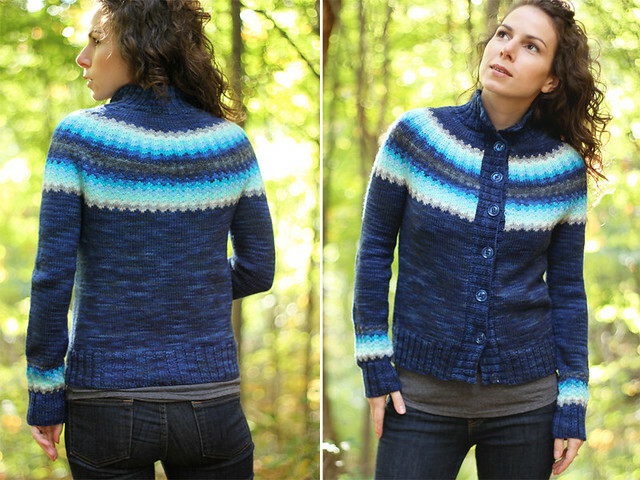 I'm convinced that any of my Palettes would be beautiful in the yoke of this sweater. I have plans to knit myself another, maybe in this colour combo? Or maybe using the Jewel Palette! 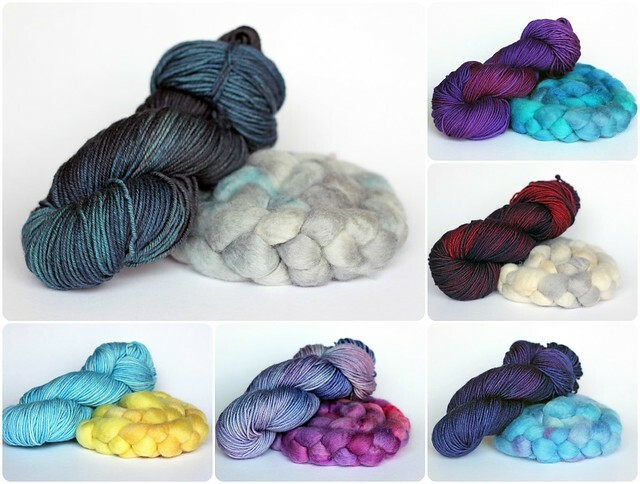 Choosing a colourway is always one of the hardest parts, which is why I've made it easy for you by making up the Coolbreeze Sweater kits! 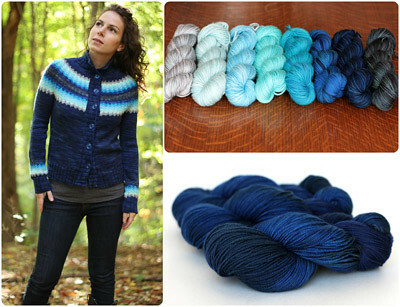 What Palette would you chose for your Coolbreeze Cardigan? Holiday Knitting KAL project #2 - check! This hat was inspired by these hats, an image of which I pinned on Pinterest long ago. Elliot is turning 4 on December 9 (his sister Abby is turning 7 on December 7th and his mom's birthday is December 11th... busy month!) Anyways, this hat is for Elliot. Elliot is an active, crazy little boy so I wanted a crazy little hat for him. I think this one totally fits the bill. When I first cast off I looked at it for a while and debated wether it was the coolest thing I'd ever knit or the ugliest thing I'd ever knit... I'm still undecided, but am leaning towards it being pretty darn cool. I love the blue and green chevron pattern, but the black and yellow bumblebee stripes on top might be a bit much. The pattern is completely improvised. Knit in TFA Yellow Label DK weight yarn I just picked a bunch of leftovers skeins that sort of coordinated and started knitting. 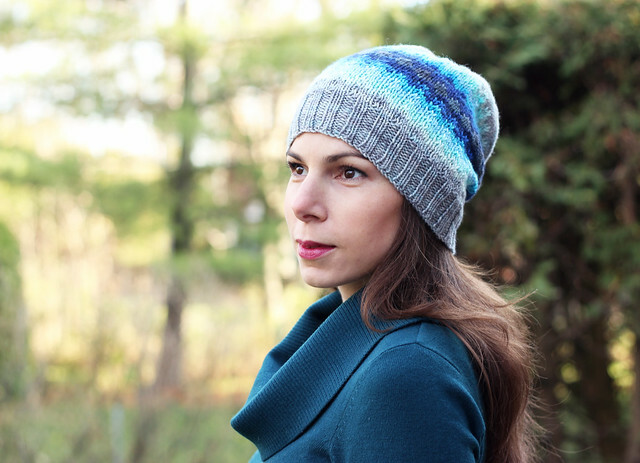 The brim in extra long so it can be folded over for double the warmth around the ears. 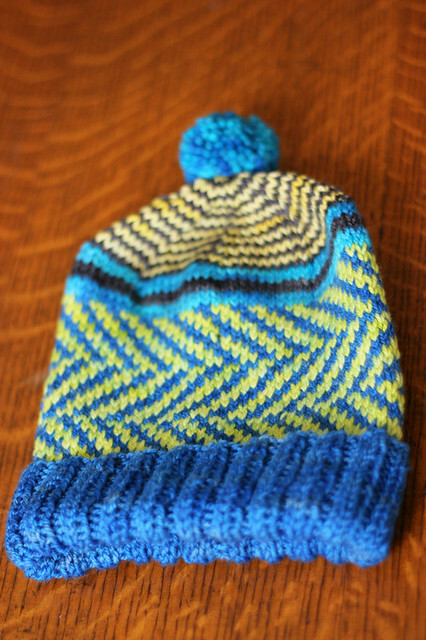 Due to the fair isle in the body the rest hat is double thick and super warm as well. Hopefully Elliot will love it! At least he'll be easy to spot on the playground with this bright hat! Introducing the Coolbreeze Collection! This collection started as a simple idea, and quickly took on a life of it's own! I wanted to knit myself a cardigan using one of my Palettes to do some fancy colourwork in the yoke... but I knew that using 8 colourways in the same yoke could get pretty complicated fast, so in order to keep it simple I opted to use a slipped stitch chevron pattern to achieve the look I wanted without all the fuss. No more than one colour is ever being used at a time. I became so enamored by the look of this awesome blue gradient rainbow that I just couldn't stop thinking of uses for it! The final collection includes 4 pieces, an adult cardigan and hat and a baby cardigan and hat. The adult cardigan and hat patterns were the first designs I worked on. 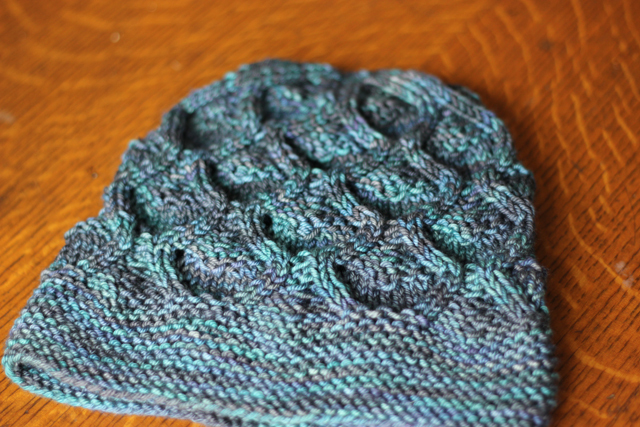 The Coolbreeze Hat was born out of the idea of wanting to knit a functional swatch. Why not cast on a few more stitches and have a beautiful, wearable swatch in the end! The slouchy fit and bright colours make for an awesome accessory. The Coolbreeze Cardigan has a relaxed feel. No waist shaping and a generous amount of ribbing at the hems make this sweater easy to throw on and wear with just about anything. Thanks a million to the adorable Lila for modeling this sweater for me! And of course, what baby doesn't need an awesome hat? 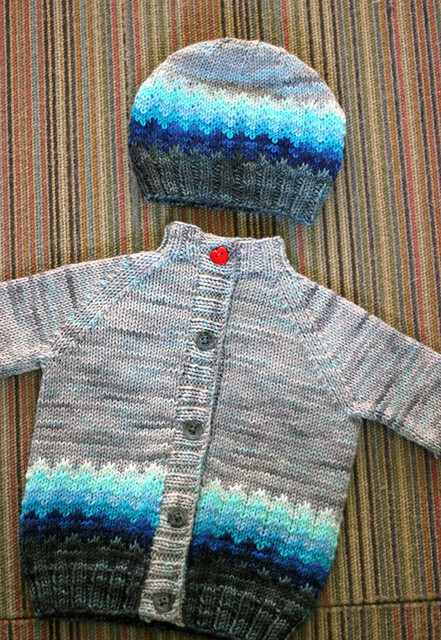 So of course, the baby cardigan comes with a matching hat pattern too. 1) as the full Collection featuring all four patterns for $9. 2) as separate patterns, ladies sweater and hat for $6 or baby sweater and hat for $6. And there is one more exciting detail about this collection... I've made sweater kits! Yes! The Sweater Kits are available in two colourways, my original Coolbreeze colourway, and a beautiful Warmbreeze colourway featuring my Rusty Palette with Sand as the main colour. 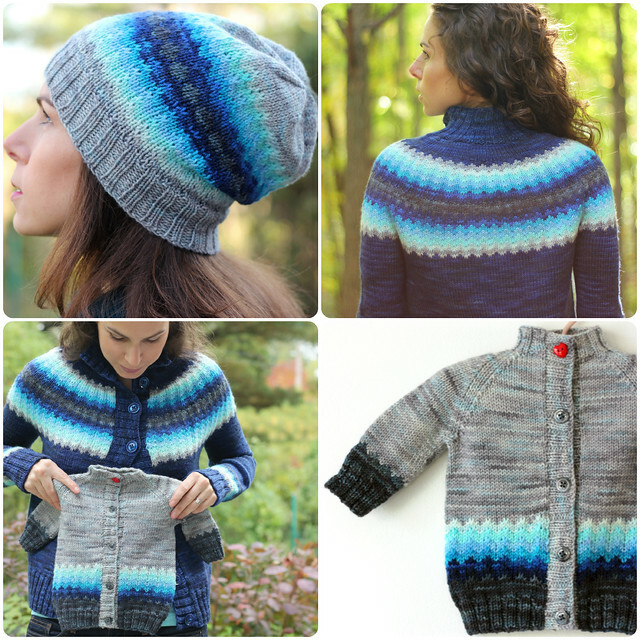 Kits are available in 4 different sizing options and contain enough yarn to knit at least 1 adult sweater and hat. Pattern sold separately. I was able to knit all 4 patterns in the collection using only 1 Palette, but the larger sizes that will require more of the contrasting colourways will have less leftover yarn for extra projects. View ravelry pattern page here. As my second Holiday KAL project I had in mind that I would knit a hat for my sister in law using the stitch pattern from the Smooth Sailing Baby Blanket that I designed for my niece. 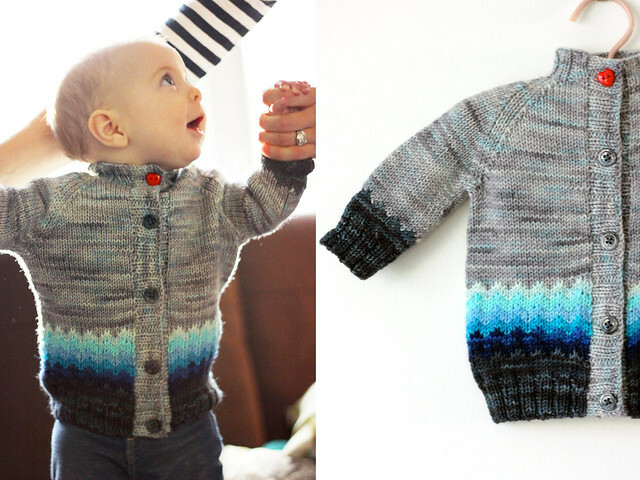 I loved that mom and baby would both have a special knit featuring the same stitch pattern. I grabbed this skein of Stormy in a really nice worsted weight MCN blend and cast on. It turned out... meh... I don't like it. I've frogged it. The stitch pattern is really highly textural and requires quite aggressive blocking to lay flat and look pretty (in my opinion) and if I gave it the blocking I think it needs it wouldn't fit. I'll come up with something else to do with this skein, I already have an idea. To ease the pain of a failed knit I gave in to my urge to do some completely selfish knitting and cast on for this knitted Christmas ornament! The pattern is Balls Up by General Hogbuffer and it's brilliant. It's just a simple sphere, but it's perfect. The key is the Styrofoam ball center, so much better than a lop-sided stuffed ornament. I've knit 3 more of these beauties and will definitely be heading to the craft store to by more styrofoam balls this week! These would make awesome Christmas gifts, but I plan on keeping the ones I've made for myself. 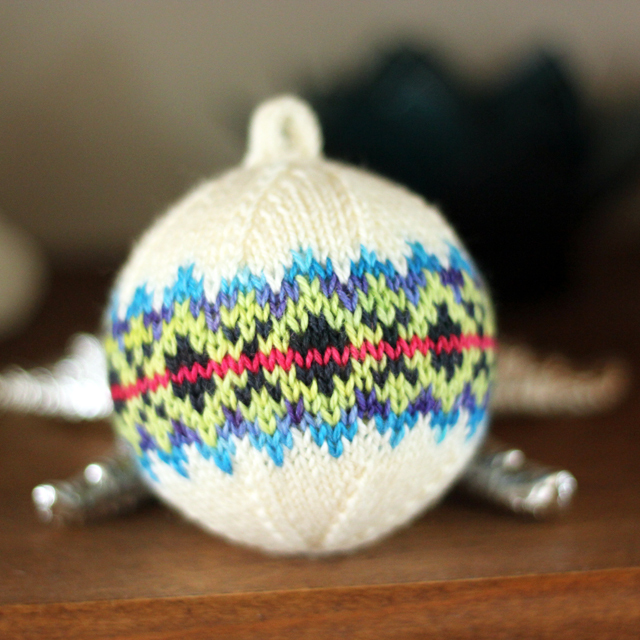 There is almost nothing I like more than a handcrafted holiday decoration, and a knitted ornament as lovely as these pretty much takes the cake for me. Yesterday afternoon Chris and I took some time to take photo's of my Coolbreeze Hat (previously known as the "Palette Hat") and while we were at it he snapped a few shots of my ever growing baby bump. I thought I'd better share it today, because by next week it probably won't look the same! I love finally having a real belly! Up until recently I just looked like I ate a big lunch, but now I can proudly show off a real baby bump. I'm feeling great, my second trimester is being quite kind to me. I have lots of energy and by some miracle I've got the best skin of my life! Most of all, I just feel lucky. I'm feeling little fluttery baby kicks and it's just about the most amazing thing in the world. My first Holiday Knitting KAL project is complete! This is the first of 4, I'm well on my way to having 4 more gifts ready to cross off my shopping list. What a feeling! Only 6.5 weeks left... yikes! This hat is for my God-daughter Abby who will be turning 7 on December 7th. 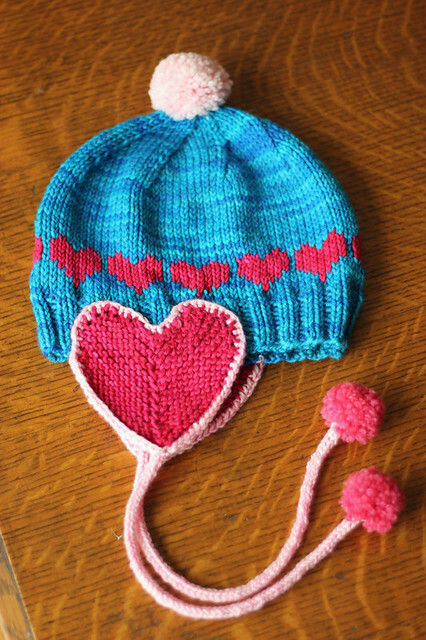 The pattern is a mash-up between my Grammy's Hat pattern (for the stitch count, decreases and proportions) and #27 Heart Hat from Knit.1 Winter 06/07 by Linda Cyr for the overall look and ear flap recipe. Back in '06, I knit a hat just like this one for my sister. At the time she was a figure skating coach and when she wore this hat on the ice all of the little girls she was teaching went crazy for it! I hope that means that Abby will love it too. I modified the earflaps slightly to make them rounder and more "cartoon-heart-shaped". I also added the crochet trim to add a bit more polish. Overall, this was a super fun project. Plenty of interest and detail (fair-isle, i-cord, pom-pom's, crochet, sewing) but in a small and manageable scale so by the time it became tedious it was already finished. 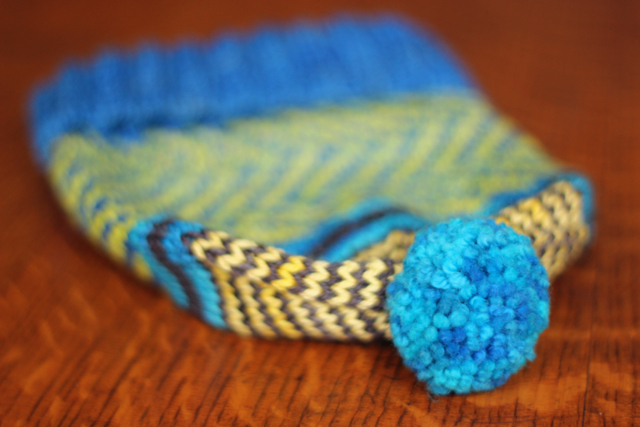 I am currently having a love affair with pom-pom's. 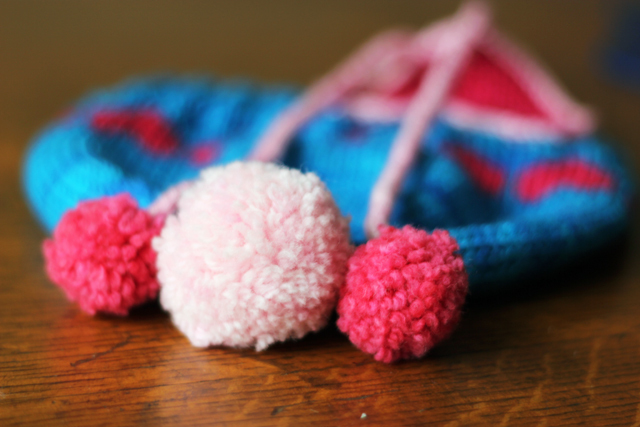 I have a fool proof method for perfect pom-poms that I'll be sharing soon. I'm considering making myself a little holiday pom-pom garland for my mantle. This is the first year that I have a mantle to decorate for the holidays! Exciting! Here is my pile of baby knits. Things that I've knit as samples, or just because I liked the pattern and wanted to knit it, thinking a recipient would present itself eventually. So you see, I'm pretty well stocked as far as baby knits go! Since we've opted to keep the baby's gender a surprise, there are a few gender specific items in these piles that may not get used, like that Clara dress... may not use that much if we have a boy ;) but other than that, most of these little items are pretty gender neutral! Especially since I don't have a problem dressing a baby girl in blue or putting a little baby boy in a sweater with a smidge of pink in it. 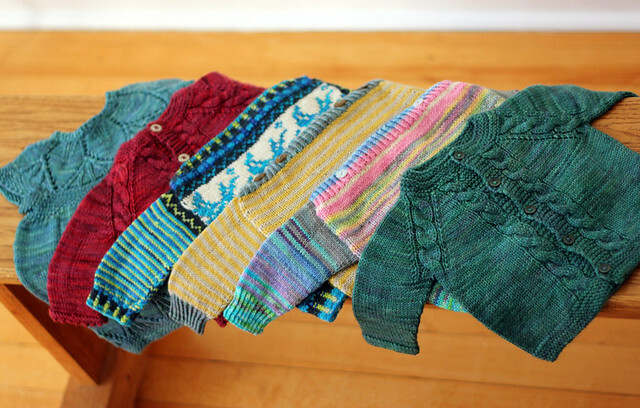 All the sweaters in the photo above are wee, they will probably fit somewhere between 0-6 months. 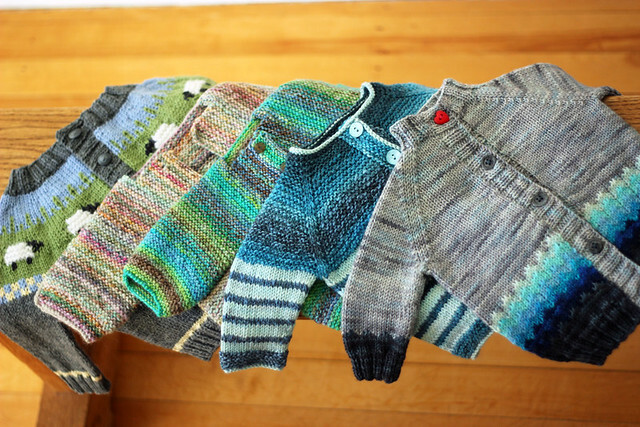 And all the sweaters in the photo below are a tad bigger, for a 6 month old or older. Honestly, who can really tell when it comes to baby sizes anyway... they'll all fit at some point! Even though I have quite the wardrobe for my baby already, I do plan on adding to it. Baby definitely needs more hats for one thing, and booties! 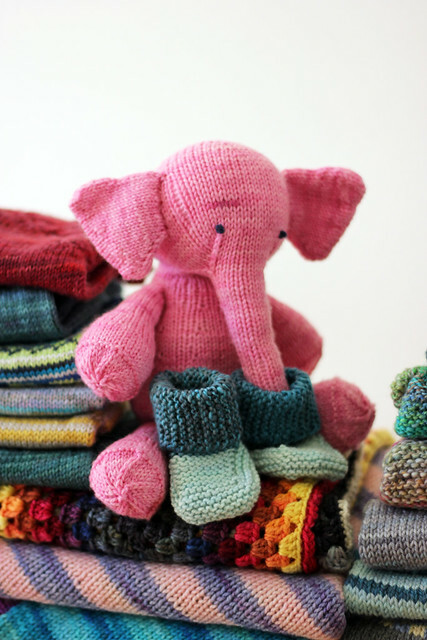 Since our baby is making his/her appearance in April, we will likely not get a lot of sweater for the first 6 months, so I plan on focussing on knits that baby can where over the winter next year. As always, things are crazy busy around here, I don't expect to have much free selfish baby knitting time between now and Christmas, but it's quite comforting to know that my baby will still be well dressed even if mom is too busy to spend the next 5 months knitting for him/her! 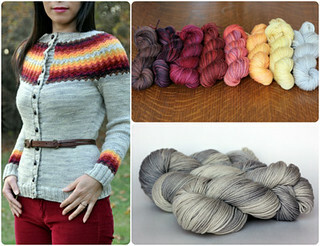 psst :: my new baby sweater pattern (pictured on the right of the above photo) will be ready soon! I changed the homepage photo collage on my website, pretty and colourful! Variety! 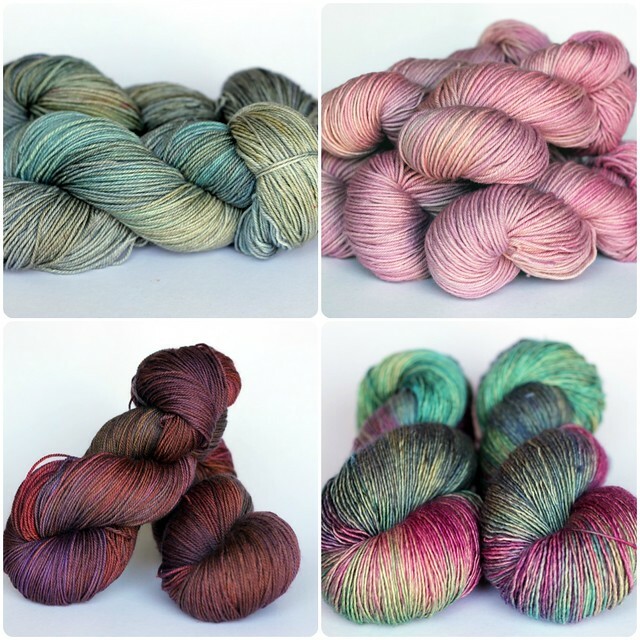 6 different yarn weights and bases will be featured throughout the year. Patterns! 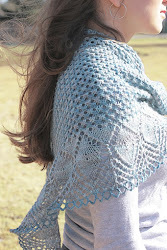 Patterns will be distributed electronically via Ravelry rather than paper copies. hopefully this makes things simpler for all our members to keep their patterns organized. No need to have a Ravelry account to make the most of this feature, just a working e-mail address. Julie and I are the star designers! We've divvied up the design responsibilities and have a game plan, again, variety is key here. Just like last year I've introduced the memberships at the same price, however due to the elevated cost of the fibers we'll be featuring in 2013, the price will be raised to reflect this on December 15th. So if you're considering treating yourself to a Club membership for Christmas, now is the time to buy! Next year promises to be just as colourful and fun as ever. Maybe the best year yet!